View of “Josh Tonsfeldt,” 2013. The primary operation in Josh Tonsfeldt’s solo show is the layering of architectural forms—the accretion of references to locations beyond the gallery that relate to the artist’s personal experiences. Tonsfeldt has transformed Simon Preston Gallery by diagrammatically integrating the Iowan farmhouse where his grandfather lived, mapping the midwestern building onto the conditions of the gallery. In the main installation eighteen three-foot-wide and nearly eight-foot-tall plaster casts of the gallery floor are propped up like Minimalist slabs to represent the modest, domestic height of the farmhouse walls inside the industrial scale of the gallery’s space. The gallery and the house architecturally fuse. 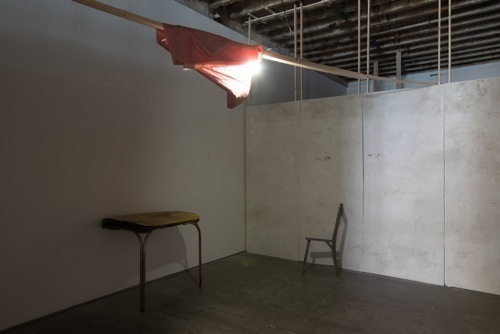 Additionally there are hints of another space—the Brussels gallery that is Tonsfeldt’s next venue, designated here by freestanding plywood sections that denote the position of the walls in Brussels and are situated at the perimeter of the plaster casts. When conceptually layered these unexpected locations act as multivalent pointers to the mutability of space and memory. Tonsfeldt returned to his grandfather’s farm after a fire rendered the house uninhabitable. It was full of decaying surplus materials, as well as damaged furniture, selected elements of which he has installed sparingly in the reconstructed house. While creating this space of memory and composite architecture, Tonsfeldt discovered behind the white walls of the gallery a forgotten window, and cut away the sheet rock to reveal it. Natural light now enters the gallery, just as daylight gained access to the farmhouse after the destructive fire. On the once-hidden windowsill Tonsfeldt found a one-gallon plastic jug holding water, which he juxtaposed with a printer lid discovered in the rubble of the farmhouse, also plastic, and melted beyond recognition. Like delicate memories pieced together over the topography of architecture, this show functions to annunciate layers of time and place.